I remember the first words I spoke to members of The Brother Moves On. It was at Rocking the Daisies in 2011; my then-partner and myself were taking a stroll between the camping and performance areas when we happened upon Siya (vocals) and Raytheon (guitar). We’d been impressed by their Saturday mid-morning performance at the main stage and wondered where their music could be obtained. It was before any of the work available on their bandcamp – The Golden Wake, ETA, and A New Myth – was released. Their myspace page had a few songs. “Sometime early next year” one of them said. They launched A New Myth this past weekend at the Museum of African Design in Johannesburg. The album was released on-line two weeks earlier, on the same day that former South African president Rolihlahla Nelson Mandela passed away. Two days prior during a listening session organised by The Con, I spoke to Siya about this new myth. It’s essentially a set of new ideals to strive towards; “our old ones are lies to us now, and we know it, it’s obvious!” he declared. The album has received all-round positive reviews, much-needed following the recent loss of the band’s founding member Nkululeko Mthembu. However, the write-ups and reviews fail to acknowledge the elements to which The Brother Moves On owe their sound. They don’t mention the importance of bands such as 340ml and Kwani Experience. They give the obligatory comparison to the Blk Jks yet omit Moses Molelekwa, the pianist for whom the band played a tribute show a few months earlier. They outright ignore the spirit of Busi Mhlongo and the spirituality of Madala Kunene’s music – vital elements to The Brother’s output. It is important to remember the progenitors when discussing black bands. There’s an inextricable link which transcends skin colour and delves into the politics of representation and acceptance in the global south – the sense of collective memory and the shared experience of cultural prejudice. But even that isn’t the sole reason. One cannot, for instance, speak of the Blk Jks without mentioning Phillip Tabane. The link stretches beyond academic discourse and overtly lightweight analyses; it is innately musical, for that is what lies at the heart of these musical formations – music as movement, as experience, as art. “You’re a genius!” one person exclaimed as he tightly hugged Siya after the show. The stage design alone made for a spectacle. A living room draped in gold, it lent an intimate feeling to not only the performance, but the venue itself – a delicate balance considering the building’s bad acoustics. 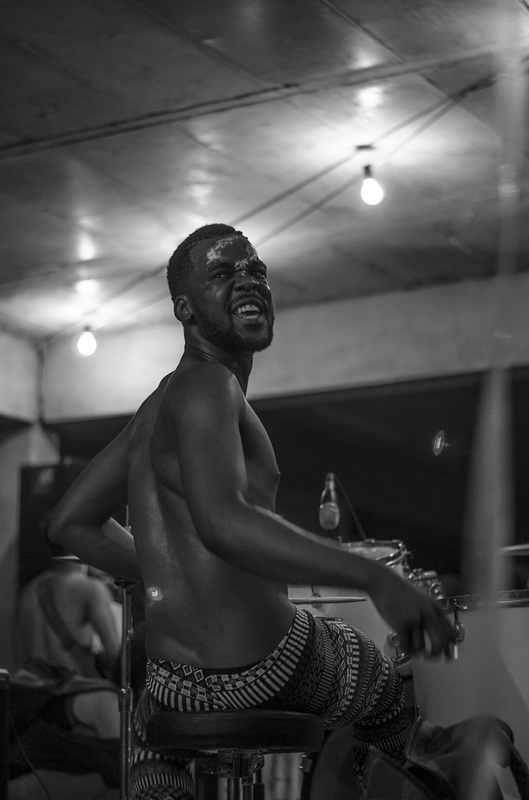 The Brother invited their extended musical family at different junctures – Nozuko from Zuko Collective (or ZuCo.) 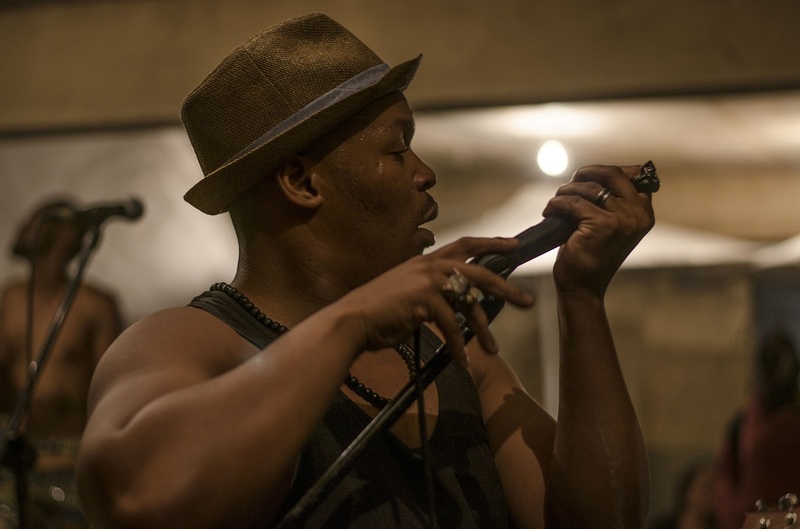 ; Samthing Soweto, solo artist and member of The Fridge; and Bra Sol from Big FKN Gun, whose utterings of ‘Washa!‘ and ‘The Brother Moves On‘ sent the audience into a rumble. A mini toyi-toyi ensued. The duo of Raytheon and Zelizwe struck jarring riffs, grinding incessantly atop Ayanda and Simphiwe’s bass and drum foundation. Siya, ever the showman, played charming host to an audience of eager participants. It was all so…rock ‘n’ roll! Yes, The Brother Moves On are a great band. However, it is important to acknowledge the influence of other great bands who came before them, and to acknowledge the bands who stand side-by-side with them in this era – bands like BCUC, Impande Core, ZuCo., and their ilk. Great article. It’s all about the influences man… props!